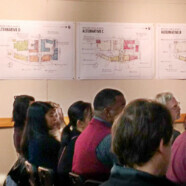 Madison Public Market workshop looks at design alternatives | Vandewalle & Associates, Inc.
MADISON, WI. 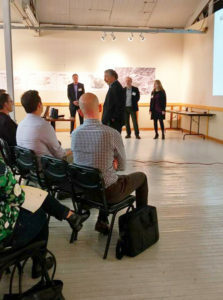 On Nov. 3 interested citizens gathered to provide input and feedback on potential planning and design alternatives for a new Madison Public Market and Market District, now proposed for the Capitol East District adjacent to Burr Jones field. Vandewalle & Associates partnered with Seattle-based Graham Baba Architects to develop common concepts and several conceptual planning and design alternatives for the district that make the most of the site’s local assets and enhance the sense of place for users. 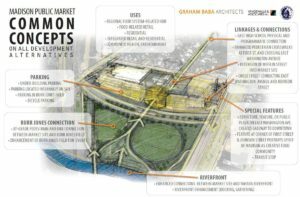 “The City’s long term vision is for the public market to foster a “market district” with related businesses co-located in the ar ea,” explains the City of Madison DPCED web site. Photos of the participants interacting with the design alternatives can be found on the Friends of the Madison Public Market’s Facebook page.